E-signature software gives users the ability to gather signatures on documents shared electronically, eliminating the need for physical documents to record signatures. E-signature software facilitates the distribution of legally sensitive documents for the collection of electronic signatures. Organizations use e-signature software to encrypt documents, such as sales contracts or employment paperwork, for which client, employee, or partner signatures are often required. E-signature software frequently integrates with third-party applications, including CRM software, ERP systems, HR management suites, and accounting, to facilitate quote, contract, and supplier management efforts. Built-in security standards that meet local and federal legal requirements further streamline the legal document exchange process and guarantee the legitimacy and legal ramifications of signatures made through e-signature software. E-Signature reviews by real, verified users. Find unbiased ratings on user satisfaction, features, and price based on the most reviews available anywhere. PactSafe’s unrivaled modern signing methods make it easier than ever to get contracts signed. Signers have the freedom to accept when and where they want, and you have the freedom to focus on something else. Signing methods include eSignature, text-to-sign, click-to-accept, SmartPacts, and more! Once a contract is signed PactSafe instantly creates a legally enforceable record - guaranteed. Comprehensive Signing Sign full documents or just document hash values (for high performance and confidentiality). Create enveloped, enveloping or detached signatures. Utilize the full power of PDF signatures: visible/invisible signatures, certify signatures (locked against change), PDF/A compliant signatures, Adobe CDS and AATL certificates, watermarking, add blank signature fields according to pre-defined templates. The ADSS Signing Server also includes server-side PDF creator and PDF viewer in pure HTML for secure document viewing on any platform. You may either use built in ADSS Server PKI components (RA, CA, OCSP and TSA) or may optionally integrate with any existing trust scheme for key generation and certification, including handling the registration process for new users. Full Long-term Signatures Embed signer’s certificate validation data into digital signatures for long-term validation using ETSI CAdES, XAdES and PAdES Part 1, 2, 3 or 4 signature formats. Embed secure timestamps into digital signatures as proof of signing date and time. Central Signing, Smartcard Signing, Mobile Signing Access user signing keys held centrally on ADSS Server or locally by the user on smart card/tokens or on mobile devices (in software app or on secure micro-SD Cards or SIM). Capture user's biometric hand-signature from popular hardware signature tablets like Wacom, Signotec and others. API Integrations Business applications can rely on ADSS Signing Server to ensure data integrity, user authentication, non-repudiation and long-term provability of information. ADSS Signing Server can be easily integrated with business applications by using our high-level ADSS Client SDK (Java and .NET) or simple web services calls. Configure all aspects of the signature process within one or more Signing Profiles, by referencing these signing profiles in API request calls, making business applications integration very simple. Advanced Use Cases Allows digitally signing documents within a standard browser without pre-installing any signing software (Zero Footprint signing solution). Other services include Bulk document Signing, Virtual Smart Card for server-side signing, Mobile Signing and Signature verification. Countasign is the single space for you and your team to execute agreements, contracts and other documents that need a signature. It's simple, fun and will seamlessly allow you to manage your document workflow. DocuFirst is the easy way to manage your business forms and documents in one simple secure online platform. DocuFirst is much more than just an e-sign solution! We allow businesses to collect and store data needed to fill forms, along with providing robust document management capabilities. K2C eSignature enables the use of SharePoint to electronically sign any document or record in compliance with US 21 CFR part 11, European Annex 11 or other similar regulations. After the installation, a new workflow action "eSignature" is available both in SharePoint Designer workflows (both 2010 workflows or 2013, based on workflow Manager) or Nintex workflow, if you are using this additional workflow tool. This action can be added at any step of the workflow in order to collect one or more user signatures without the need of any custom development or coding knowledge. eSignatures.com is powered by PactSafe™ and gives you access to an intuitive user interface, a variety of modern signing methods and automated recordkeeping for all of your legal events. SmartSAFE is comprised of integrated components that provide the functionality necessary to meet the technical and legal requirements of transactions governed by ESIGN, UETA, UCC, SPeRS, and GPEA. IdenTrust Trust Sign is an electronic document signature solution that enables you to complete, sign, and deliver digital documents securely and privately over the Internet. Document integrity and authenticity are ensured by Trust Sign, and the electronic signatures are legally binding. PDFpen is a PDF editor to add text, images, and signatures to PDFs. SignCenter is a HIPAA-compliant, web-based electronic signature and data capture tool built specifically for healthcare. Signers can mark and sign documents using a keyboard, mouse or touch screen, from any web-enabled device. Signicat Sign IT is an online signing service that is fast and simple to use. It allows users to sign documents, wherever they are. We’re set apart by our Independent e-Signature™ solution, in which the e-signature’s evidence is embedded in the signed document, not linked to an external server, as is the case with many dependent e-signature vendors. This means that the legal evidence behind our Independent e-Signature™ is accessible offline and forever remains with the document, so users have control over their e-signatures and the documents in which these signatures reside. Independent e-Signatures™ also adhere to international, published standards, not private propriety standards – further supporting the perpetual validity of Independent e-Signatures™, as standards in the public domain will always be discoverable, even if they fall into disuse. We also give users complete transparency of the signing process with immediate and complete access to the legal evidence supporting e-signatures’ validity from the first signature on. eOriginal SmartSign® Services provide a comprehensive, highly secure electronic signature solution that serves as the launching point for fully digital transaction management. Through an extensive collection of programming interfaces, SmartSign seamlessly integrates with existing document or content management systems to create more streamlined and efficient business processes. eOriginal SmartSign can be delivered as a web-based application, mobile application or embedded application, and offers customers and partners a variety of integration options, ranging from minimal (“zero”) integration to a complete OEM embedded solution, depending on business requirements and transaction volume. Vizolution provides a suite of solutions that create digital bridges between channels to create seamless customer journeys. ZorroSign is a unified platform of complete digital transactions management solution designed to bring bank-grade security to e-signature, automation, document management system, and an unique technology to verify and authenticate e-signed documents. 4identity is the technological solution that empowers web applications with a digital signature and authentication processes. Assently E-Sign is a SaaS for e-signatures and smart contracts. Autenti.com is a digital signage software for documents approval and signing contracts online with one-click e-signature. Blockusign is a document signing powered by blockchain. Carizma First complements Carizma and simplifies the process of requesting, creating and signing contracts. Connective offers digital transaction management solutions. Digio eSign is a cloud based, secure, 100% Legal Enterprise Digital Signature SaaS for Indian businesses. Doctual is a platform for building, signing and getting professional reviews on legal documents easily, reliably, and cost-effectively online. E-signature solution for digitalization of the business processes. eOriginal's eAsset® Management Platform enables businesses to go beyond simple electronic signature functionality to manage the entire lifecycle of a digital transaction in a fully electronic environment. For needs ranging from secure storage to pledging or collateralizing in the secondary market, we treat each and every transaction within this platform as a financial asset that must be verifiably secure, legally compliant and enforceable. These post-signature services can be classified in three categories: Vaulting, Transaction, and Transferable Records Services. The eOriginal solution gives end users the control to manage their eAsset documents while securely providing access to additional authorized participants such as lenders, document custodians, investors, auditors and legal counsel. With this platform, companies can extend the use of eSignatures across the enterprise to even the most critical and collaborative transactions and business processes. The eAsset Management Platform is signing-tool-agnostic, and can easily integrate with any electronic signature solution available in the market or developed within your organization. We understand that each business has a unique set of needs and requirements, and therefore we offer this solution as a SaaS or On-Premise model. E-Sign Dashboard is software packed with features that allow you to conduct business on the go, without paper. Capture wet legal electronic signatures on contracts and documents, electronically manage documents, send and receive faxes, send documents via email, retrieve and access documents via the web, and a host of other features delivers a completely paperless mobile office solution. eSignifi adds the convenience and security of electronic signatures to your ServiceNow platform. It allows designers and developers to include eSignature steps in new or existing ServiceNow workflows. PDCflow's Payment Hub offers Accounts Receivable digital signature and document delivery software. Get a document signed and returned in minutes via text, email or chat. Acquire legal wet signatures, deliver documents or request photos. This user-friendly, mobile optimized application can be integrated with payments to authorize any one-time payment or recurring schedule. With unlimited users and templates, your whole team can create custom workflows to meet your document and signature needs. Fingerink is electronic signature and document manager software. Fingerink is great for inviting internal employees and external parties to sign documents with auto-attaching of the final document back to the system. Fingerink makes it simple to merge field data into templates, insert clauses and text based on rules,and issue signatures online. With Fluix your team will be able to both capture customer signatures remotely and in person. With Fluix, you can simply capture the signature on an iPad or iPhone screen using a finger or a stylus. Fluix enables anyone with an email address and a web browser to officially sign documents. Fluix automates sending multiple documents to various people at the same time, capture their signatures and receive signed copies. FormAPI can send webhooks or post a message to Slack when a PDF is generated. Capture signatures electronically and apply them digitally to documents. K2C Smart Watermarker for SharePoint allows to add a watermark to a PDF file and print or save it as a new file. Enable end-to-end business process digitization with electronic signatures and combat check fraud in real time by leveraging a robust combined risk score. Leegality is a platform for digital business documentation. We provide secure, legally acceptable, tamper proof, quick and convenient Aadhaar eSign and eStamping facilities to all kinds of businesses. Lightico equips companies to complete their complex customer-facing processes in an instant. Lightico’s platform speeds-up collecting customer’s documents & IDs, signatures & consent, eForms and approvals, and compliant payments- all instantly, even from their cell phone. With Lightico’s real-time customer-processes and workflows, businesses complete their transactions 80% faster, reduce their compliance costs by 40% and improve their first-time completion rate by 50%. Lightico’s real-time customer engagement solution saves companies time and money, and improves customer satisfaction. MSB is a cloud-based digital workflow and esigning solution that allows complete automation and control over key aspects of your paper-based document processes. MSB also features shareable document template libraries, flexible retention periods, long-term storage options and integration with existing management systems. MSB will help you lower costs, improve ROI and maximize business growth. Notarize is the first platform to empower thousands of people each day to sign and notarize documents online. From adopting a child to buying a home, Notarize builds trusted products and services that support life’s most important moments. For more information on our vision, visit notarize.com. Sending a contract or other document that requires signatures electronically becomes even more convenient when you can ensure that those documents are both shared and stored securely. Aside from the paperless work environment that e-signature software helps create, the tool does its best to minimize the anxiety of waiting on the recipient to sign and send back the contract, without knowing if the document has been received or seen. In a nutshell, an e-signature is a digital way of putting pen to paper. According to the Electronic Signature and Records Association, an e-signature can take the form of a sound, symbol, or process. E-signatures can be captured on a computer, tablet, or mobile device. E-signatures verify and validate the intentions of the signer. After all, depending on the nature of your business, signing and tracking contracts on the go can be a convenience or a necessity. More e-signature vendors are adding mobile functionality to their products either in the form of native iOS/Android applications or through a mobile browser. E-signature technology does away with, or provides an appealing alternative to, the traditional methods of preparing, sending, signing, and verifying documents, agreements, and contracts. It simplifies that entire process and can stand up to legal muster. E-signature software provides users with the ability to securely collect signatures on electronic records, such as sales contracts, proposals, and employment paperwork. Due to the sensitivity of records exchanged and signed with e-signature software, most products adhere to strict industry standards for security and encryption. In June 2000, U.S. Congress passed a federal law, appropriately named the E-SIGN Act, stating that electronic records and signatures cannot be “denied legal effect, validity, or enforceability solely because it is in electronic form." Therefore, digitized contracts and electronically submitted signatures hold the same legal weight and can pass the same legal scrutiny as old-school paper documents. Some e-signature solutions come equipped (or facilitate the integration) with solutions that offer e-notary functionality. While both solutions support the data integrity of sensitive documents, electronic notarization goes beyond encrypting and securing electronic signatures. Additionally, many e-signature products offer out-of-the-box integration with popular CRM or document management tools. Integrating an e-signature product with your CRM or document management platform can make the contract signing process more efficient and easier to manage. There are several benefits to adopting and deploying an e-signature solution in your business. Some of the most significant and talked-about benefits include reduction of costs, enhancement of customer relationships, faster contract turnaround, ensured security, and adhered compliance of shared documentation. In addition to industry specific compliance concerns, functionality needs differ across industries. E-signature vendors typically provide contract templates for businesses in industries such as insurance, real estate, financial services, government, and health care. Efficiency - A fully digital process allows contracts to be sent, edited and signed over email much faster than through the postal system. Improved productivity - Less time spent on signing and processing contracts across your company saves money and allows employees to spend more time on their work. Since the enactment of the Uniform Electronic Transactions Act (UETA) and Electronic Signatures in Global and National Commerce Act (E-SIGN) in 1999 and 2000, respectively, electronic signature software has become ubiquitous across business operations. These laws established general rules and guidelines for electronic signature tools in global commerce, paving the way for their usage across a variety of industries. E-signature software can be used to solve a multitude of problems frequently encountered by business professionals. In e-signature software reviews on G2 Crowd, users said decreasing document turnaround time and ensuring secure and compliant business records are two of the most significant business problems solved with e-signature software. The biggest benefit of utilizing e-signature software is time saved. Filing documents, sending documents to recipients, searching for lost or misplaced documents, and tracking down either lost contracts or delinquent signers are all situations where businesses increase their operational efficiency using e-signature tools. E-signature solutions make for faster contract turnaround, a reduction of bottlenecks, and real-time regulatory compliance. E-signature products can help your business comply with regulations by providing the ability to securely store documents for a set time and track the signing process for auditing purposes. Additionally, customer relationships are enhanced because users and administrators can make good on documentation promises, as well as ensure synchronization across all parties and processes. 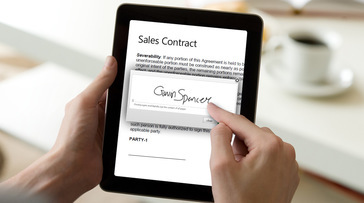 E-signature software isn’t just used by salespeople hoping to close deals. While most e-signature solutions are indeed leveraged to finalize business contracts, the technology is utilized in a variety of vertical industries. A few examples of those vertical industries are health care, banking, real estate, construction, not-for-profit, legal, insurance, and property management. Additionally, e-signature software can range from standalone products that integrate well with digital document management solutions to buffed-up solutions that provide users with an end-to-end document management platform. The functionalities of such a comprehensive platform includes automatic notifications, integration with or provision of a file storage and sharing tool, and secure PDF generation. Prior to the advent of e-signature software, transactions involving multiple parties required physical documentation and signatures to be viewed as legally compliant. Often this meant that documents needed to be physically mailed to the other party, and copies would be kept as a record of receipt. This decreased the overall efficiency of transactions and longer sales cycles. In cases when parties made amendments or disagreed with a contract, the time required for approvals could balloon exponentially. E-signature software streamlines the flow of documents with multiple features designed to simplify document creation, establish workflows, and remind parties to submit signed documents. Many industries, including those of banking and real estate, depend on these technologies to support their day-to-day business operations. All types of electronic signatures adhere to signature laws and requirements. E-signatures can be used for both personal and business use on document types such as invoices/work orders, sales contracts, real estate contracts, non-disclosure agreements, school forms, lease/rental agreements, insurance forms, and project estimates. Cloud – Cloud e-signature tools offer a software as a service (SaaS) pricing model and work inside a browser; most new e-signature tools were born in the cloud. The cloud pricing model is typically a set price per user per month. Cloud tools are easy to implement, do not require hardware investments, and allow you to pay overtime based on usage. On-premise – On-premise e-signature tools are installed on hardware owned and maintained by the customer. Most customers who use on-premise tools purchase a perpetual license based on the number of users and pay an annual maintenance fee. On-premise tools might be client-server tools that require software to be installed on each user’s PC or might be browser based. On-premise tools require IT support to install and maintain and also require investments in hardware. Electronic Signatures – In general, the term “e-signature" refers broadly to any type of electronic authentication method. That method simply needs to verify the signer identity, so it can range from a corporate ID to a verified email account. E-signatures have the ability to come equipped with multi-factor authentication to align with increased measures of security when necessary, while also creating an audit trail. Digital Signatures – The term “digital signature" refers to a very specific type of e-signature. Digital signatures are an amped up version of an e-signature (in terms of security). They usually require a certificate-based digital ID that adds a level of encryption to the identity verification method. Then the digital signature is generally validated through Certificate Authorities (CAs) or Trust Service Providers (TSPs). While both e-signatures and digital signatures can be used for a variety of business purposes, the latter is most commonly used with processes that have higher variables of risk. A few examples of more highly regulated business processes are loan approvals, bank transactions, HR manager processes, quality and safety approvals, and doctor signatures. Many businesses have come around to the fact that digital transformation is key to business growth. Couple that with the increasing BYOD-motivated mobile workforce, and digitization technologies are not only desirable but necessary. E-signature software, from the onset, had to battle with public perception that 1) electronic signatures weren’t as binding as “wet" signatures and 2) they posed an inherent security risk. Yet, by now, vendors have had years to hone and optimize the security measures behind their solutions. To promote acceptance of e-signature technology, many vendors strive to meet or exceed industry security standards such as the Digital Signature Algorithm (DSA), a Federal Information Processing Standard for digital signatures adopted in 1993. Standards such as these ensure guidelines are in place for the secure transferral and signature of contracts using modern encryption technologies. Companies using e-signature software are subject to a variety of compliance requirements. In accordance with the E-SIGN act, financial institutions are required to maintain accessible electronic records of documents for a period of time. HR departments also must take care that their use of e-signature software for employee onboarding is compliant with the Health Insurance Portability and Accountability Act (HIPAA) of 1996. Most e-signature products offer detailed information about their security standards and technology. If security features are your primary concern when choosing an e-signature product, you should select a product that offers advanced document encryption capabilities, secure access and authentication features, and non-repudiation. By comparing the offerings of each e-signature solution, you can ensure that you select the product with the optimal blend of security features for your business. Additionally, paperless offices aren’t just a luxury, they’re becoming a necessity. The sheer amount of space that paper documents and files take up is problematic on a number of levels. Aside from the ways that an electronic or virtual document management system can keep a business lean and mean, that same system promises much more security and efficiency. Aside from the valid (but ever-diminishing) security risk that users believe e-signature solutions can pose, there are a few other issues with the software that users should be aware of when making a purchase decision. Storage — Most e-signature tools are cloud-based. For the few that are hosted on vendor-specific servers, businesses can be concerned with the level of control they can exert over those servers. Proprietary Software — Along similar lines as the above point, proprietary software can cause users to worry that they must stay with one vendor, lest they lose or compromise any secure documents passed through the solution. Verification Process — The criteria to certify the legality of e-signatures are that the signer must be authenticated, legal disclosure and consent must be given by the signer, the software must protect documents against hacking or tampering, and some sort of audit record must be kept throughout the lifecycle of a document. However, that requires the software to provide a credible process of authentication and verification of the signer. Encryption — The encryption capabilities of the e-signature software is crucial to verifying the validity of the entire document. Contract management — Contract management software simplifies and streamlines the entire contract lifecycle. Since an important part of contract management software is its compliance to business legal requirements, the software is a sensible fit for e-signature software, which also makes sure to adhere to legal regulations. Proposal — Proposal software streamlines the creation, editing, and submission of proposals and RFPs. Some proposal software offers built-in e-signature functionality, and others integrate seamlessly with third-party e-signature tools. CPQ — CPQ software automates the lifecycle of the entire quoting and proposal process of contracts. While e-signature software is usually utilized at the end of that lifecycle, the effectiveness of CPQ software correlates with its ability to integrate both downstream and upstream. CRM — CRM software maintains an expansive database of sales contacts. CRM software helps businesses keep track of prospects, leads, and other activities related to sales efforts. E-signature software leans on that database to confirm the recipients and points of contacts throughout the contract lifecycle. 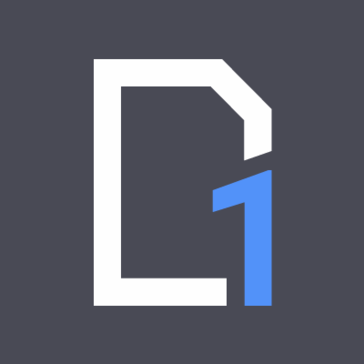 Document generation — Document generation software enables users to create and edit documents such a PDFs and other templated documents. Document generation solutions help ensure that businesses maintain brand consistency and import relevant information from third-party systems like CRM and ERP. Mobile forms automation — Mobile forms automation software provides workflows to track the progress of created transferable documents. E-signature software takes on similar tracking functionality, keeping all relevant parties in the loop, so that users can reach out to and resolve blockers. Risk-based authentication (maybe) — Risk-based authentication software provides scoring and threat assessment capabilities to businesses. The software analyzes IP addresses, devices, behaviors, and other web-based identities to determine the authenticity of the user. E-signature software verifies signers through means of identification to confirm that the digital signature belongs to the person who was meant to sign. Hi there! Can I help you find the best E-Signature solutions?